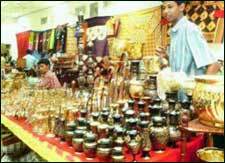 Lepakshi Crafts Bazaar is an event that took place between 13-Oct-2006 and 22-Oct-2006 in Hyderabad. That Lepakshi goods are affordable is a rumor. That they are good isn't. For 10 days, know everything else you want at this mega-spread. With the onset of the Diwali season, the Lepakshi showroom at RTC X Roads is organising an exhibition of its handicrafts and handlooms, at Sri Satya Sai Nigamagamam, from 13th to 22nd October. Various handicrafts and handloom items will be on display at the exhibition. In the handloom section, there are silk and cotton saris from Mangalagiri, Venkatagiri, Kalamkari, Pochampally, Gadwal, West Bengal Kanta, Orissa, Bhagalpur, Jaipur and Banaras, and also bedsheets, tussar silk and Mangalagiri saris and dress material. The sought-after handcrafts section has wood carvings, cotton durries, Kutch embroidery, antique furniture, Kondapally toys, Hyderabad pearls, pottery and leather lampshades. All major credit cards are accepted. For further details, please contact 2766-8178.